An exciting and very profitable Beyond Today video recording trip was undertaken July 18-28 to areas of Germany and Belgium. All three U.S. TV presenters were on the journey, and they recorded two programs each. In addition, UCG’s German-language presenter, Paul Kieffer, recorded three programs in German. A crew of four also accompanied the presenters: two cameramen, a producer and a logistics assistant. What we are producing are “documentary-style” programs that we believe will engage our viewers intently with the gospel message. Gary Petty recorded his material right at the church where Martin Luther nailed his theses to the church door—plus at several other historic locations. In addition, other prophetic and Christian-living topics were recorded by Steve Myers and Darris McNeely, which are relevant to the preaching of the gospel of the Kingdom. Unfortunately, the journey got off to a slow start when important technical equipment did not arrive in Berlin, Germany, on time. An entire case of camera equipment was delayed for about 16 hours. Thankfully, we received the delivery at 1:30 a.m. just in time for an important standup recording session inside the historic Pergamon Museum at 6:30 a.m. that same day! Permission was sought ahead of time for shooting video at a number of places along our route. In most cases fees had to be paid for the permits, and we had to record either before or after visitor and museum operating hours. This made for early mornings and late nights! The most important to our needs were the Martin Luther locations and the Pergamon Museum. 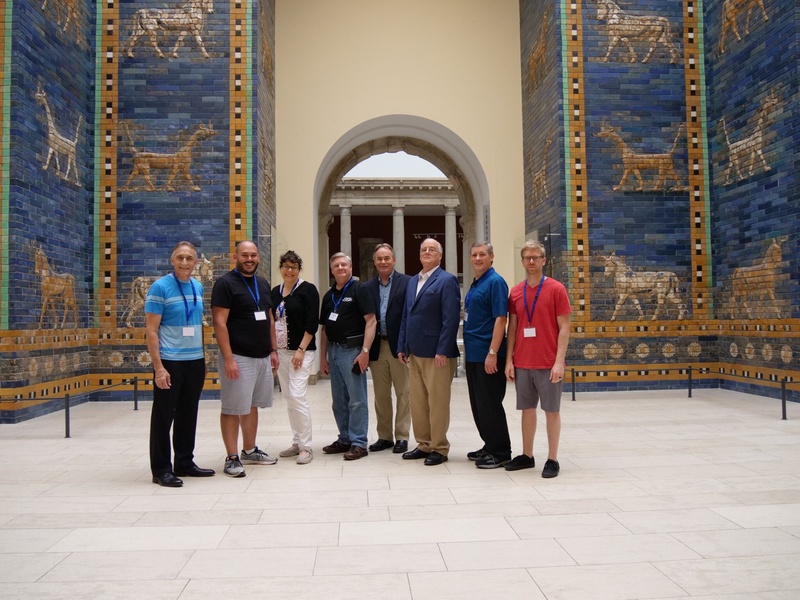 The Pergamon Museum and its Babylonian Ishtar Gate exhibit in Berlin. Gleis 17 (Track 17), a memorial for deported Jews in Berlin Grunewald. The Topography of Terror in Berlin. The Memorial to the Murdered Jews of Europe in Berlin. The Reichstag (German parliament building) in Berlin. The city of Wittenberg and the Luther Castle Church and also the Lutherhaus (where Martin Luther lived for a time). The Buchenwald concentration camp in Weimar. The Aachen Cathedral where Charlemagne built a large church and throne upon which many European kings were crowned. The European Parliament in Brussels, Belgium. The area of Waterloo in Belgium and its Lion Hill and battlefield panorama exhibit. At the Aachen Cathedral we recorded some very good material at the throne that Charlemagne built, but then decided to record much of the remainder outside on the plaza—rather than inside where our words might be found offensive to parishioners and church staff. Our Beyond Today TV team is enthusiastic about a very successful, safe journey, and we thank everyone for prayers that contributed to the success. Without God’s help and protection it would not have been so successful. We look forward to showing you the edited TV programs in the months following the Feast of Tabernacles!